I have had many conversations with marketers regarding how to focus on ensuring that adequate and appropriate content is ready for consumption. The following is what could happen if we take a chance and really focus on delivering content to consumers. I do have to put a disclaimer that the following case study is not about a current Resolution Media (RM) client, nor did RM set out to put the program together for the Snuggie brand. It came about as a result of my friend and co-worker, Mr. David Barnes, wanting to do good for a worthy cause. So, the way this story starts is with two friends wanting to help a charitable organization after one friend returned from a trip to Tanzania. David’s friend wanted to do something to help the AC Orphanage in Tanzania after spending some time there. David immediately got on board and the two friends started to brainstorm how they could raise some money to make a donation. At the same time, some of their buddies were watching a Snuggie commercial, when the idea was brought to life. Pair up Snuggies with a pub crawl in Chicago, with friends donating money to help raise funds for AC orphanage. Now, when you first read this, you might not be on board. This is also why David and his friend wanted to get a litmus test on how many people would be interested. To understand if their initial group of friends would want to participate, David set up a website to collect email information from his friends that were interested. The goal was to try to get between 50-100 people on board and willing to participate in the event. What happened next is something that shows the reach of viral marketing when no boundaries are put around it. Once the email was sent out, their friends forwarded the email and website to their friends, and their friends forwarded it to their friends and so on…2 hours after the initial email, there were 200-300 registrations and by the 2nd day, there were 500 registrations. Also, at the end of the 2nd day, the extended network of friends created a Facebook group, Twitter page and various blogs. 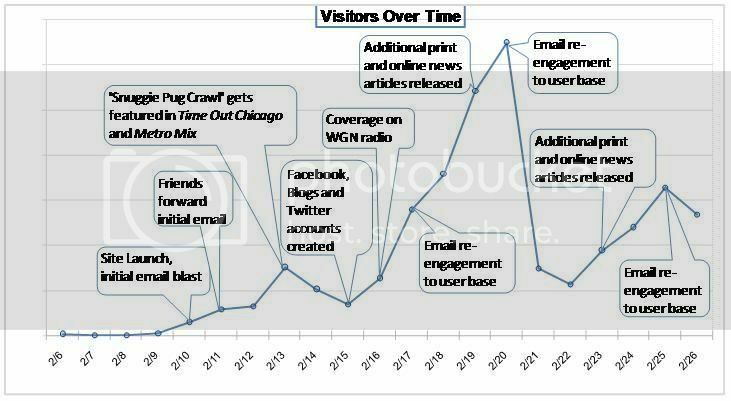 As a result, link exchanges naturally started linking the 'Snuggie Pub Crawl' to online articles. David started recognizing the magnitude of what was happening and tweaked the website immediately to account for the buzz that had been generated. He set up an affiliate program that would allow interested participants to buy a Snuggie and register with their email for the pub crawl. What happened next is even more phenomenal. The chain of events goes something like this: the viral marketing created buzz in the area, which created social networking, which created awareness of the content, which then led to newspaper, radio, and TV spots. The ‘Snuggie Pub Crawl’ was covered in the Chicago Tribune, WGN News, NBC, MS NBC and the NY Daily News, just to name a few. What started as a small local campaign was now garnering national attention and interest. Soon other markets also wanted to launch their own ‘Snuggie Pub Crawl.’ Subsequently, the website was tweaked again to get some general feedback; interested parties could recommend the next city for the pub crawl. As a result, the pub crawl is launching in 15 markets, not to mention, raising more money than originally imagined for AC Orphanage. So, (if you have a Brand you are marketing) what does this tell you? The value of your campaign cannot be fully realized if you bind DR metrics to content outreach initiatives. The impact viral marketing had on the Snuggie Pub Crawl allowed David to collect well beyond the initial 50-100 participant goal. If David’s content outreach program had been limited by DR metrics, and not been allowed to push awareness, the current reach and benefit to the event would not have been realized. There is urgency in viral marketing, the buzz is NOW! You need to be fully committed with your tech resources to create new content and implement changes to your websites when there is buzz. David would not have been able to capitalize on the buzz if he had not been able to tweak his content and website immediately to fulfill the needs of the market. Conventionally, we think that TV and other traditional media need to generate the volume that will ultimately go online to search. 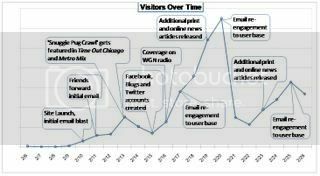 This case study clearly shows that viral marketing and social networking also have the same effect. The interesting thing about the ‘Snuggie Pub Crawl’ was that it started small, with digital media support, and grew large and garnered traditional media attention. Per my prior blog post, all marketers need to be thinking about their content outreach strategy in this recessionary environment. We also need to be willing to take that ‘leap of faith’ (especially in the case of DR) and have the patience to set up what could be a very successful content program.